We are big fans of IHOP because we like that we can get our breakfast favorites any time of day. Sometimes especially after a late night we tend to sleep in and don't always make the cut off for ordering breakfast at many restaurants. So it's nice to know we can always count on IHOP to have our breakfast any time of day. And I personally love that they are always changing up their "What's New" menu with limited time specials so there's always something new and fun to check out. On our last trip in I actually took the leap and tried Cupcake Pancakes. And I have to say they were surprisingly good, and tasted a lot like a cupcake! If you've not checked out their Bakery Favorites specials yet I encourage you to hurry up and hit your local IHOP to check them out for yourself. 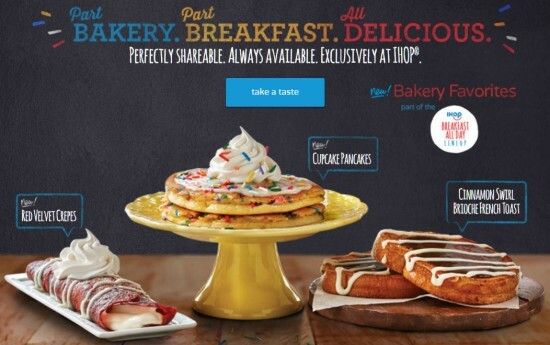 Right now guests visiting their local IHOP® restaurant will encounter the sights, scents, and sweetness of their neighborhood bakery with innovative new twists on fresh bakery favorites available for a limited time including new Cupcake Pancakes, new Red Velvet Crepes, or Cinnamon Swirl Brioche French Toast. • NEW! Cupcake Pancakes – IHOP restaurants’ signature buttermilk pancakes filled with festive rainbow sprinkles, then topped with cupcake icing, and whipped topping. • NEW! Red Velvet Crepe – A delicate, chocolaty crepe filled with IHOP restaurants’ sweet cream cheese, drizzled with cream cheese icing. • Cinnamon Swirl Brioche French Toast – Thick slices of Brioche French toast topped with rich cinnamon roll filling and delicious cream cheese icing. Guests can enjoy their choice of a Bakery Favorite item any time of day as part of a sweet and savory combo with eggs, made to order, their choice of IHOP restaurants’ signature hickory smoked bacon, pork sausage links or a slice of perfectly grilled ham, and golden hash browns. IHOP has some amazingly creative meal offerings. I'd like to try their new Cinnamon Swirl Brioche French Toast ! I'm a plain pancakes person. I like tasting the basic ingredients and the syrup together. Im all about red velvet flavors! Thanks for letting me know about this promo! Do they have any offerings for Diabetics? The food you mentioned sounds great, but I can't eat it. I love their crepes. I usually get them when I go. My son would love the cupcake pancakes. I love their strawberry crepes. My kids would love the cupcake pancakes. Chocolate chip are their next favorite!